I saw that sign recently. And for some reason, it bugged the hell out of me. I know what it is implying. Someone who reads the bible a lot has a lot of wisdom in dealing with problems that the world throws at you. It goes along with the statement: “How do you spell love? T-I-M-E” Spending time in reading the Bible and meditating on God’s words is a very important part of our Christian life and discipline. 2) Rick Warren said at Saddleback’s Conference: Sometimes, the person that knows the Bible the best is the most cantankerous, hate-filled, close-minded person you will ever meet! They’ll quote you the Bible inside and out, but they’ll also spew other things at you or others. Do you believe in loving your enemies? Then you don’t really believe in that part. Do you believe in tithing? Yes, there are examples in the Bible. Well, do you do it? Then you don’t believe in it. Our faith consists of two relationships: me and God and me and you. We can’t be good at just one. Both are equally important. I can spend all my days in devotion and prayer, but we show love to God by showing love to others, as John writes. And when we engage in acts of social justice or serving others, we are reminded that we do this because our love for God does not allow for us to sit back and let the world pass by. Me and God. Me and you. We need to be mindful of both. Bumper Sticker Theology annoys me more than it should. What’s wrong with being open-minded? But… that’s another post in of itself. Better to have my brains falling out than being closed shut and gathering dust. Bumper sticker theology never really clearly gets the point across. But once in a while, they’re hilarious, and I applaud the genius of the person who thinks of these things. But what we believe is far more deeper than the space a bumper sticker or church sign offers. I hate bumper sticker theology as well. And church signs are horrible. Just so I’m on the record as saying that! 1. The Havens Corners church is confrontational. Their sign lets “outsiders” know what kind of people they are. Cantankerous and nasty are the words that come to mind (I used to live really near there and would drive out Havens Corners Road frequently). 2. As far as Bible reading goes, I find that the more I read, the more I realize I *don’t* know – the more questions I have, the more I learn by reading. 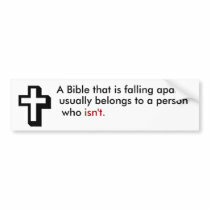 I certainly wouldn’t brag about having a falling-apart Bible; yes, I think that falls into the same category as praying on the street corner. i think what that picture implies is more of the idea that the more you read (and assuming that you obey) the more stable your life becomes. When i read that picture, it floored me in that i realized how true that really is. It’s the wise man foolish man story where one obeyed and the other didn’t.